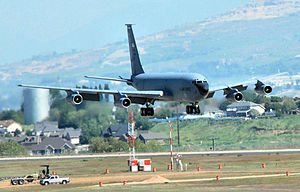 The 151st Air Refueling Wing (151 ARW) is a unit of the Utah Air National Guard, stationed at Wright Air National Guard Base, Utah. If activated to federal service, the Wing is gained by the United States Air Force Air Mobility Command. The primary mission of the 151st Air Refueling Wing is to provide air refueling support to major commands of the United States Air Force, as well as other U.S. military forces and the military forces of allied nations. Additionally, the unit can support airlift missions. The unit is also tasked with supporting the nuclear strike missions of the Single Integrated Operational Plan. On 1 July 1958, the Utah Air National Guard 191st Fighter-Interceptor Squadron was authorized to expand to a group level, and the 151st Fighter-Interceptor Group was established by the National Guard Bureau. The 191st FIS becoming the group's flying squadron. Other squadrons assigned into the group were the 151st Headquarters, 151st Material Squadron (Maintenance), 151st Combat Support Squadron, and the 1151st USAF Dispensary. The group was gained by the Air Defense Command (ADC) 29th Air Division. In 1958, the 151st FIW implemented the ADC Runway Alert Program, in which interceptors of the 191st Fighter-Interceptor Squadron were committed to a five-minute runway alert. Its existing F-86A day interceptors were replaced by the F-86L Sabre Interceptor, a day/night/all-weather aircraft designed to be integrated into the ADC SAGE interceptor direction and control system. On 1 April 1961, the 151st was transferred from Air Defense Command to the Military Air Transport Service (MATS), and re-equipped with C-97 Stratofreighter. The 151st Air Transport Group expanded its military airlift role to worldwide mission capabilities. Entering the realm of Southeast Asia and the Vietnam War, the Utah Air National Guard flew its first mission into the Southeast Asia theater combat zone in late 1964, and continued to do so throughout the Vietnam War years. In January 1966, the unit became the 151st Military Airlift Group (151 MAG), under the Military Airlift Command [MAC]. In 1969, the C-97s were retired and replaced by the C-124C Globemaster II. During the Vietnam War, Utah Air Guard crews flew 6,600 hours of support missions for American forces. The 151st Military Airlift Group was transferred to Strategic Air Command (SAC) on 1 July 1972 and was equipped with second-line KC-97L Stratotankers. In 1978, the squadron received KC-135A Stratotankers; a newer and faster jet tanker. In January 1979 the unit began the 24-hour-per-day Strategic Air Command (SAC) alert commitment. This commitment would be maintained for the next 12 years until President George Bush ended the SAC Alert Force in 1991. During Operation Desert Shield, the squadron received orders for a partial activation on 20 December 1990. All aircraft, aircrews and a number of support personnel were dispatched to the newest forward operating base at Cairo West Airport, Egypt on 27–29 December 1990. They became the basis for the 1706th Air Refueling Wing (Provisional). Other unit personnel were mobilized for use as stateside "backfill" (replacing troops sent forward) or sent to overseas destinations. On 30 April 1999, the 151st ARG was tasked for a Presidential Reserve Call Up due to the crisis in Kosovo. President William Clinton authorized the call up of 33,000 reserve personnel for up to 270 days. The 191st deployed to Europe to support Operation Allied Force. Following the terrorist's attacks on the United States the squadron was tasked to provide aerial refueling support for the countless fighter combat air patrols performed over major U.S. cities. Dubbed Operation Noble Eagle (ONE), the 191st ARS flew their first ONE mission on 12 September 2001. The highest sortie production occurred in November when fighter combat air patrols occurred every four hours over most of the major U.S. cities. In addition to supporting ONE, the 191st ARS also provided support for Operation Enduring Freedom (OEF), deploying aircraft and personnel to Spain to support combat air operations from late Sep 2001 until the spring of 2002. At home, local communities see many benefits from the Utah ANG. Many opportunities exist to meet legitimate military training needs while serving the community. Activities include Sub-for-Santa, Blood Drives, highway cleanup, and the 2002 Winter Olympics. The Utah ANG also maintains a state of readiness should Utah need support during an earthquake, flood, civil disturbance, or major disaster, and was involved in assisting evacuees in the aftermath of hurricanes Katrina and Rita. ^ "Utah Air National Guard base will be renamed for war hero Roland R. Wright". National Guard. Retrieved 10 November 2017. Wikimedia Commons has media related to 151st Air Refueling Wing (Utah Air National Guard).